The latest issue of Famitsu magazine is packed with details relating to the forthcoming 3DS installment of Animal Crossing, including news that the game will showcase a gardening store, thrift outlet and raccoon housing project — the latter being run by everyone's favourite exploitative landowner, Tom Nook. You'll also find a shoe shop, 24-hour museum and a fully-blown shopping mall. The game will also allow you to assume the role of mayor, and customise items like fences and doors. All of which should make this entry in the series the most addictive yet, with more items to find, furniture to purchase and hours of the day to lose forever. There's no release date for Animal Crossing 3DS yet, but when it is confirmed, you might want to think about booking a few weeks off and informing relatives and loved ones that they may not see much of you for a while. Or better still, find a nice, dry cave in which you can retire and give the game your full, undivided attention. Better yet, buy a 3DS and a copy of the game for your friends and family. A much more cost-effective way for sure. I'm so glad this game is coming out next year though. If this was out now or earlier, I would have failed school already. Or better still, find a nice, dry cave in which you can retire and give the game your full, undivided attention. OH MY GOD THE POSSIBILITIES ARE ENDLESS! Ohhhhh how I crave an EU release date. Please let it be close to the US release, and not months after. @Mahary Well you're going to have to wait a little longer, as it won't be out till next year. I hope you have to run for election to become mayor, that would be hilarious. @GuardianKing Well I hope he's not playing it in NoE's dungeons!The only reason I'm able to keep my impatience within bounds is because I keep telling myself they're polishing off every tiniest aspect of the game - down to each little flower, tree, pair of shoes, furniture set, animal comment, joke and event. Nintendo must know that this game is eagerly awaited by all AX fans from three to ninety-three, and they won't want to disappoint us. Fingers crossed! It's funny how just some new features can make a game sound so amazing. I would love to buy this. @Melvin2898 It helps that the past 3 Animal Crossing games were excellent. I'll be in the market for a top-of-the-line cave. I've never been a big fan of Animal Crossing, but I might have to try this one out. Seeing this game footage make you realize just how lazy other developers are when making games for the 3DS. I'm so looking forward to this game, I'm still wish it was coming out this year but the extra time should make it more likely that it will be the best in the series. Sheesh, I need to finish Wild World in a hurry!!! Dang. I was hoping the trailer was a new one. Oh well. I'm pretty stoked for this entry into the franchise! @Burning_Spear you can't finish the game. 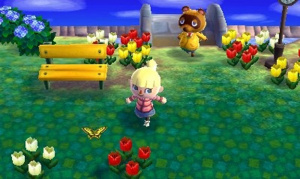 These new features sound like wonderful additions to Animal Crossing. Good thing I have City folk to tide me over, I don't think I could handle the wait without it. I mean complete the museum and the gyroids. and I'm really excited for the link costume and the master sword. Day one Download for me! To get my self hyped up, I want to play the previous AC games, but I just can't find myself being addicted to them as I once was. I liked the idea of the auction from City Folk but the friend codes kinda ruined it because there was nothing in the auction. Still its an idea I'd like to see expanded in future games. Anyway all that aside Animal Crossing is a special game and I love it. If it offers something new and is better than the NGC one, then I might buy it. If you could make all the villagers your personal slaves for picking weeds from all over the town and make it clean, then it´d be insta buy! Can't wait! This game looks like it might be the best in the series! Whooo can't wait! Will be my first 3DS game, or the only one that counts. Mannnnn this game has been in the dark way too long! But i'm happy they are taking their time on it...I want it to be just as addicting as the first game. @Collinhall I knew it! I just noticed in my video trailer analysis YAY ME! Forget a cave. Get a BATcave and you're set up for Animal Crossing, your every entertainment need on a theater-sized screen (pixlated as HA-IL though) plus little things like the ability to spy on everybody! Unless it's your run-of-the-mill bat cave, in which case you're still looking for a power source and have plenty of company to fly in the face of everything you do, literally. Don't be alarmed if you don't see me for a whole blooming year after this releases. Meh, I'm done with AC...Wild World was fun and all...but I couldn't even stay into City Folk. Pretty sure its going to happen with this too. The things I would do for this game to be in my hands right now. I'm thinking of buying two copies, too! This game cannot come fast enough to NA. 2 years Reggie 2 years....I am tired of waiting. Are my Club Nintendo survey responses of "Animal Crossing 3DS or RIOT!!!" in every one of my surveys not getting through to you? The moment I sit down with this game and boot it up on my 3DS, I will know everything will be okay. I've never played any of the Animal Crossing games but this one has me interested. If I get this, I want to play with lots of people. The good thing is that even though this game won't be coming out in the West until next year it will be coming out in Japan in a couple months so soon we'll get to see everything that's in the game. Meh.. sorta expected more shops while the game haves it own mall... CMON.. next year. COME! @Jamouse The Animal crossing game on Wii had various items that referenced other Nintendo franchises so I doubt it will just be Zelda items in this game. That third and last paragraph! ROFL! The cave retire option sounds tentative, count me in! I want this game to have the ability to transfer your character + catalog items from the Wii version, I'm filthy rich in CF & finished almost all sets & have a perfect town. I even play the game up to this day since 2008, so I hope that is added onto for 3DS Download. i am getting this game. No.Questions.Asked.